Today has been a very wet and rainy day, which isn't surprising for Scotland. The grey weather can be very depressing sometimes and the cold temperatures certainly don't help...Winter is definitely upon us! Time to stock up on chunky knits and cosy scarfs! 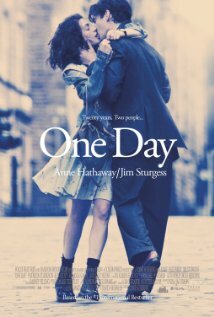 I've spent the majority of my afternoon curled up in a ball with a cup of tea in one hand and 'One Day' by David Nicholls in the other. 'One Day' has to be one of the funniest, loveliest books i've read for a while. I admit, I don't read as much as I should and I am prone to just sticking with a good murder mystery but I couldn't ignore the hype over 'One Day' and i'm glad I didn't. The movie was equally good and it helps that Jim Sturgess is yummy to look at.